In the face of growing tension, taunting, and downright weird interactions disrupting space relations between the United States and Russia, it's reassuring to remember that NASA and Roscosmos have founds ways to cooperate for over four decades. 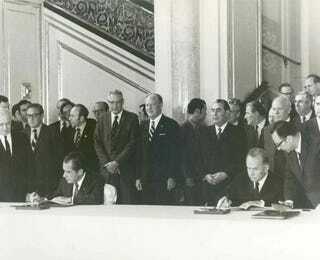 On May 24, 1972, the United States and the Soviet Union signed an agreement to cooperate in space. While the original agreement long ago expired, I appreciate the reminder that even during the Cold War, we found a way to get along enough to share (some) science and work together to increase the safety of people visiting such a hostile environment. Tip via the NASA History social media team. For a single coherent analysis of the current tensions, Planetary Society has a nice write-up.